Pat is the wife of Houston's brother, Gary. Not long after Houston's passing, the couple became two of the co-executors of Bobbi Kristina's $20 million trust. Pat had a restraining order against the youngster's boyfriend, Nick Gordon, last year, though the pair are believed to be on good terms with Brown and have been by her bedside while she fights for her life in hospital. It's important to remember that the allegations are wholly unsubstantiated, and there are a number of important factors regarding the accusations that we need to note. Firstly, investigators did not find any sign of foul play with Whitney's death, which was officially attributed to heart issues and drug use. Moreover, while the authorities previously confirmed that there is a pending criminal investigation surrounding Brown's hospitalisation, it's believed Gordon, who recently gave an interview with Dr. Phil, is the person central to the enquiry, though this has not been confirmed either. 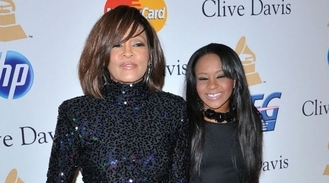 It's also not been ruled out that Bobbi Kristina, who has been in a medically induced coma since being found face-down in a bathtub on Jan. 31, had underlying health issues that could have contributed to her hospitalisation. According to Gossip Cop, the Houston family have labelled Jerod's new allegations about Pat and “murder” as “insanity”. “He's not in anyway associated with the family,” the insider added. “The police record speaks for itself." The claims come just days after another member of the Brown family, Leolah Brown, alleged that Nick Gordon was being investigated for "attempted murder".